Myanmar is the best place I’ve ever been. Its borders stretch from the rice terraces of China’s Yunnan Province to the Andaman sea, a little above Phuket, from the Shan hills to the shores of the Bay of Bengal which it shares with India. It’s a country with remote craggy mountains topped with gold-spired stupas, smoky lakes and emerald encrusted pagodas by the sea. The people are friendly and generous and interesting. 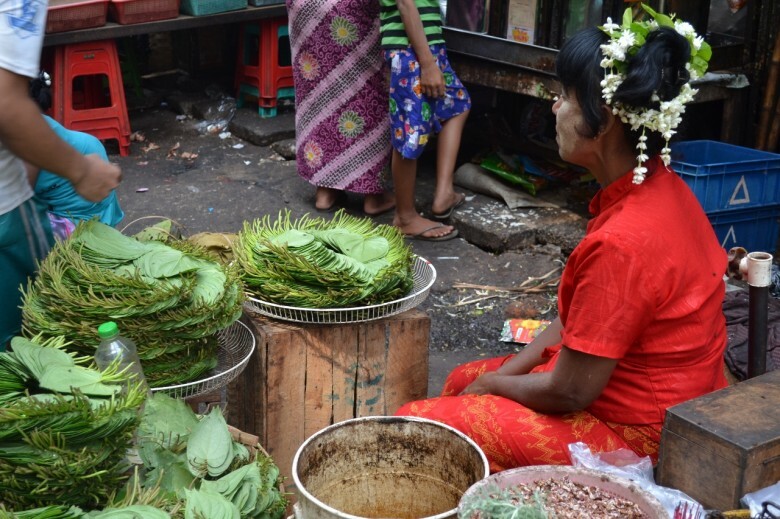 The women wear fragrant plaits of jasmine in their hair, gold thanaka powder on their cheeks and smoke cheroots (thin cigars). 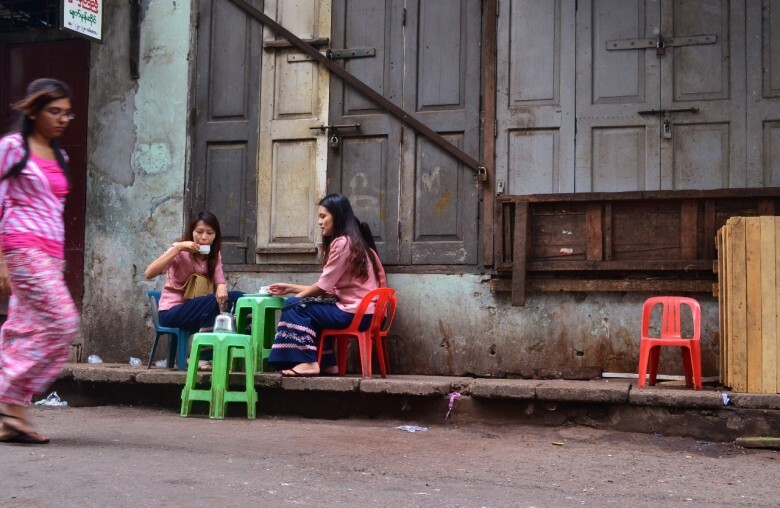 The streets are pitted with purple streaks from betel spit and there are Japanese silks and lumps of rough jade, ruby and sapphire to be bargained for in the markets of Yangon. The Burmese people have weathered British colonisation, Japanese war-time occupation and decades of a crippling military junta. Though there are still many human rights abuses, Myanmar is recovering. People have time to give you a smile and ask you where you are from without wanting anything in return. 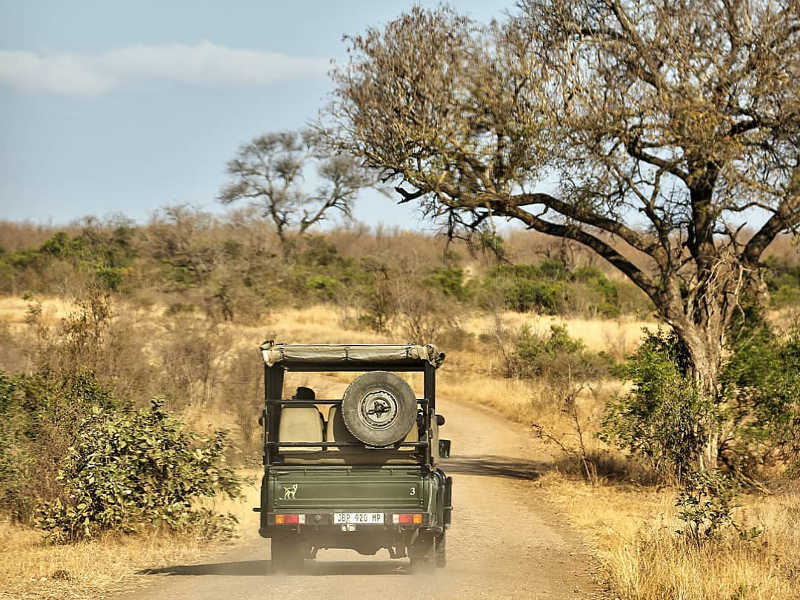 Since January 2015 South Africans are no longer required to visit the Pretoria consulate in person and are allowed to apply for an e-tourist visa online (which is valid for 90 days from date of issue, with a single entry and 28 day stay allowed per visit). Apply here. Also the hottest season ended in April so the next few months will be cool and rainy and then temperate, the best being the months of September, October and November. This is really easy, all you need to do is have a scanned passport photo to upload and the address of your first hostel or hotel. The Myanmar Embassy asks that you check your eVisa status online. Once your e-Visa is approved an Approval Letter is sent directly to your designated email address. Your e-visa is only valid from 90 days after it is issued. It’s only valid for a single entry so if you want to leave and visit other countries in South-East Asia you will need to apply for a second one if you want to return. You are only permitted to stay in Myanmar for 28 days at a time. Your e-Visa permits you entry through Yangon, Mandalay and Nap Pyi Taw airports only. You will need a return flight or a flight booked out of Myanmar when you arrive (to prove you plan to leave). When I went in 2013 you needed crisp recently-issued dollar bills of $10 and up- however travelers report that the Burmese Kyat is now preferred. You can exchange dollars at Yangon and Mandalay airports easily. R1 is equal to 92 Kyats and $1 about 990 Kyats. 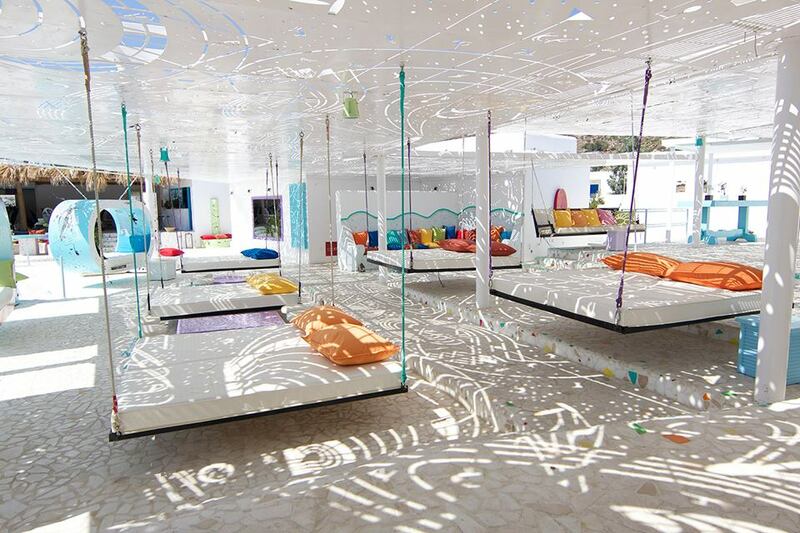 Accomodation can be found from about $20-$40 per person per night for something very basic. I slept in what was literally a low-ceiling-ed storage cupboard (with a mattress) in a Yangon hostel one night and that cost $10. Restricted areas in Myanmar can still present a problem, you’ll need to apply for a permit to visit them and this may take a long time to be granted or may not be granted at all. Most city centres and the places I list below are deemed OK. Find out more here. Which is correct- Burma or Myanmar? Myanmar (officially the Republic of the Union of Myanmar) is increasingly the most-recognised name, however the democratic political activist Aung San Suu Kyi has advocated using “Burma” as Myanmar was imposed by the military dictatorship that took over in the 1960’s. Britain still refers to her ex-colony as “Burma” though since sanctions are being lifted the media mostly use “Myanmar”. You can can fly from Johannesburg to Hong Kong, Bangkok or Singapore and transfer to a connecting flight to Yangon. 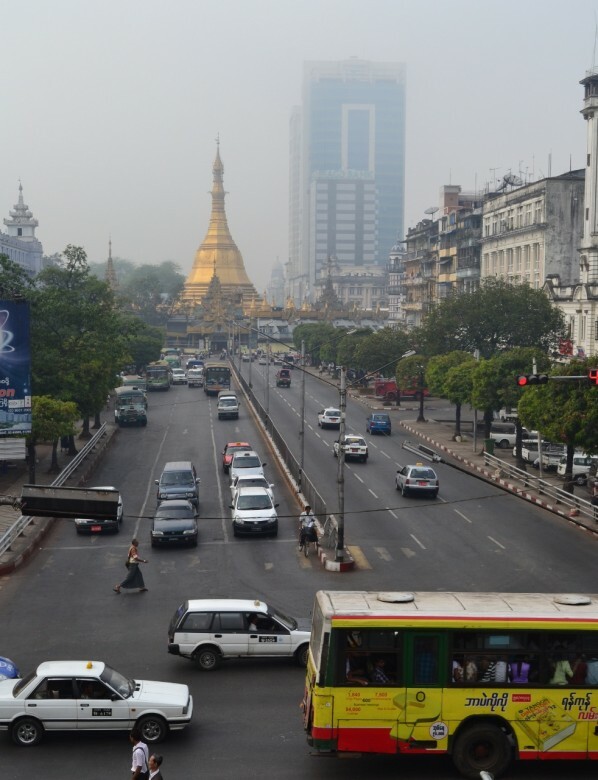 It’s possible to find a return journey with taxes included from Johannesburg to Yangon for R8500. Having read Paul Theroux’s accounts of the trains in Myanmar and George Orwell’s (of 1984 fame) early novel about Burma I was inspired to cover as much of the country by train as possible (sometimes taking a bus to speed up travel time). So much has been written about this country it makes you want to see every inch for yourself. The trains are British relics so if you value comfort then a short flight between major cities will serve you well. If you have a little time and want to get a sense of the landscape then take the train. I recommend going economy class so that you can meet and talk to people besides the travelers in first class (this is also cheaper as the train tickets for foreigners are charged in US dollars- economy class is about $11-$15 for longer journeys). 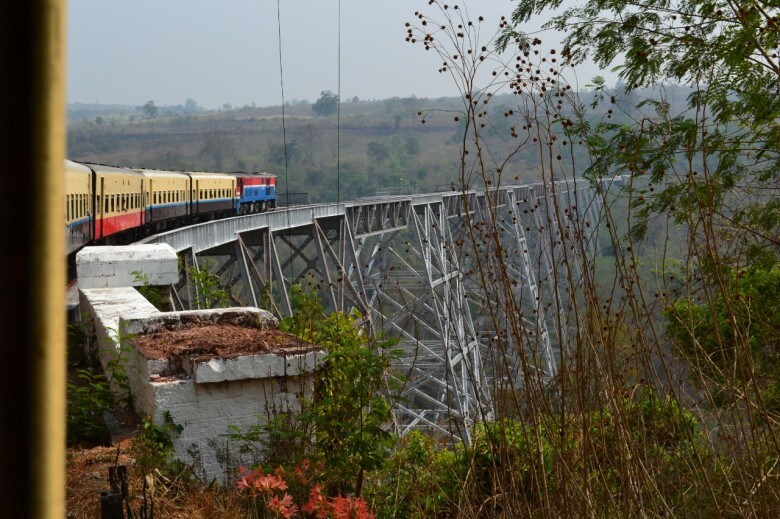 The first train journey I took in Burma was from Yangon to Mawlamyine in the South. The tracks had warped so I was jolted awake a few times as the carriage lifted into the air for a heart-thumping second. 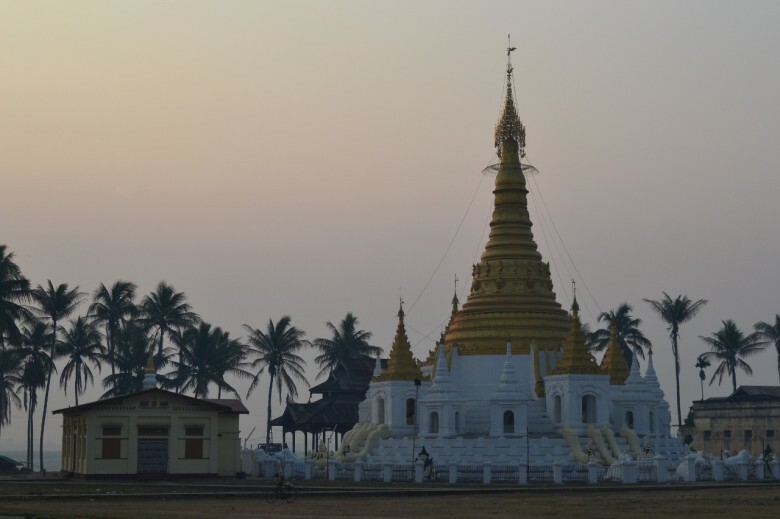 I arrived at Mawlamyine, home to Kipling’s famous pagoda, early in the morning with mist lifting off the Thanlyin river and the promise of adventure. Orwell had lived here and as I was following his ghostly traces around Burma, this seemed like a good place to begin. I took a walk up to Kipling’s famous pagoda and passed some ladies pausing to eat Mohinga (breakfast noodles with fish sauce) at a vendor on the way up the mountain, so I bought some too and sat a while. It is possible to take a river boat from Mawlamyine up the river to Hpa-an (a 1 hour drive by bus). I would recommend spending a night in Mawlamyine then resting a few days in the peaceful village of Hpa-an before returning to Yangon. I had bought some brightly flowered material in the market in Yangon and here I had it made into a Burmese blouse while drinking hot sweet tea from one of the many wooden tea houses in town. I recommend taking a boat to the foot of the mountain across the river and climbing to the golden stupa- or visiting the nearby caves with the reclining Buddha. Mandalay, the last royal capital of Burma, is so romanticised by Kipling in his poem that I had visions of a crumbling exquisite palace city like Ankor Wat. The palace complex burnt down in WWII so only the palace walls remain (the buildings inside have been rebuilt by forced labour). Mandalay is rapidly industrialising with the help of China and it feels like a booming Chinese city, filled with exhaust smoke and the flurry of industry. An unmissable experience is climbing up Mandalay Hill at night to visit the wish-fulfilling pagoda. There is now a road for cars to reach the top however it is considered meritorious to climb. You’ll be out of breath by the time you finish those stairs (no shoes allowed because this a sacred place) but the view is well worth the effort. 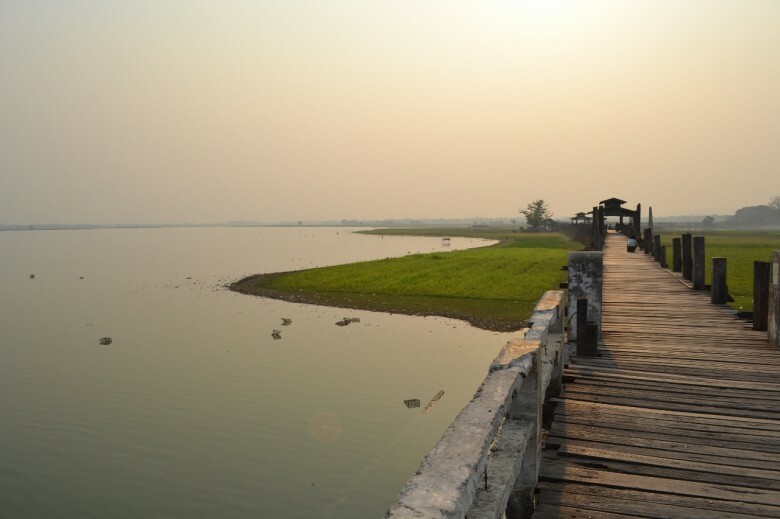 If you find Mandalay overwhelming, escape to U Bein Bridge in Amarapura. 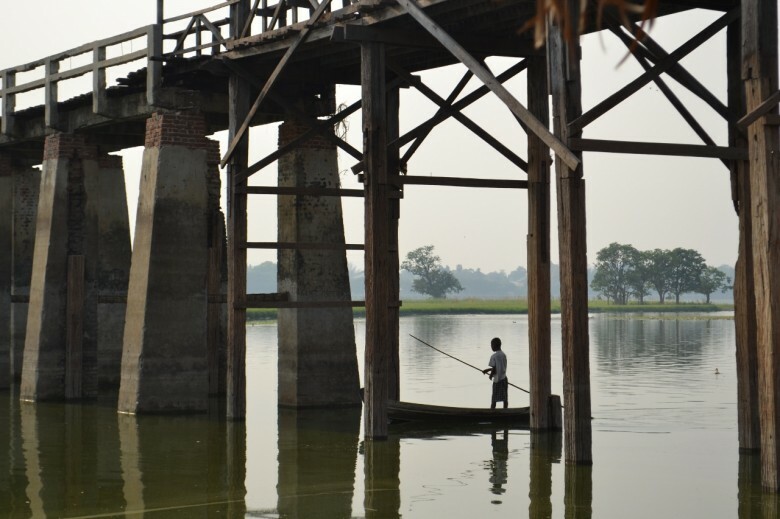 It is the oldest and longest teak bridge in the world made with wood from a former royal palace. Only a 20 minute bus trip from central Mandalay, the bridge is used as an important passageway by local people. 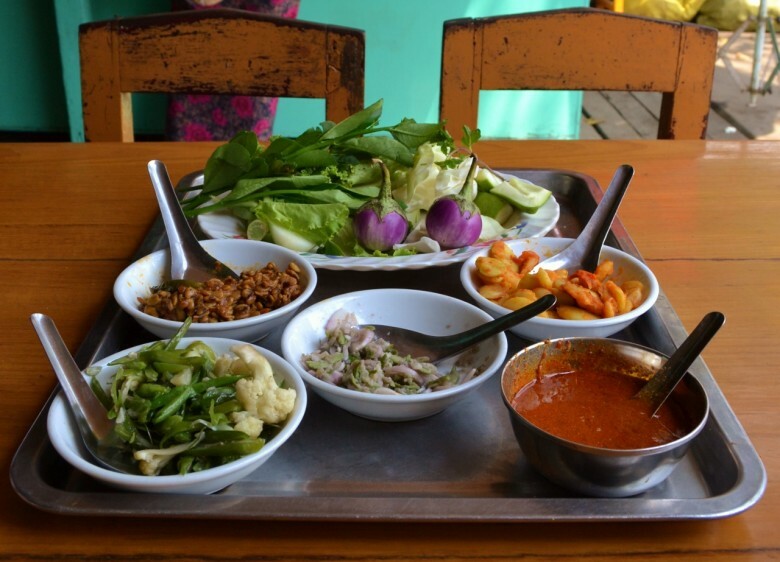 It spans the Taungthaman Lake and you could easily while away an entire day eating and drinking at the little café’s on the banks of the lake and watching the procession of cows, dogs and buffalo. The gilded Sule Pagoda at the centre of Yangon is said to be older than the Shwedagon and has featured in Burmese politics for decades as a rallying point for protestors. 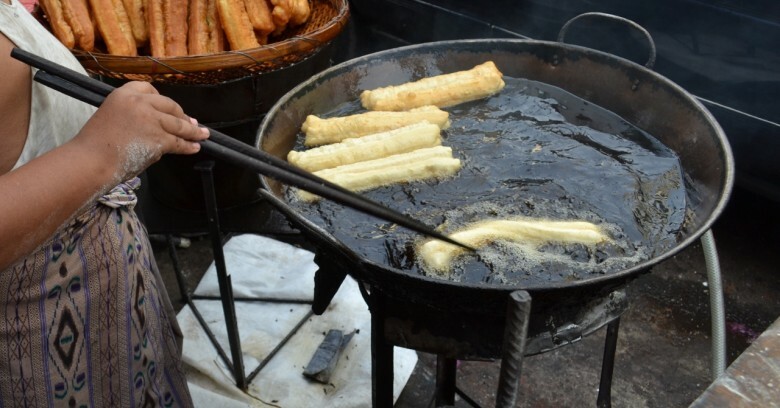 I loved waking up early to walk the streets in Yangon, stopping to sit at a very low table on the street to eat e kya kway, a popular fried dough breakfast food that can be dipped into sweet tea or coffee. 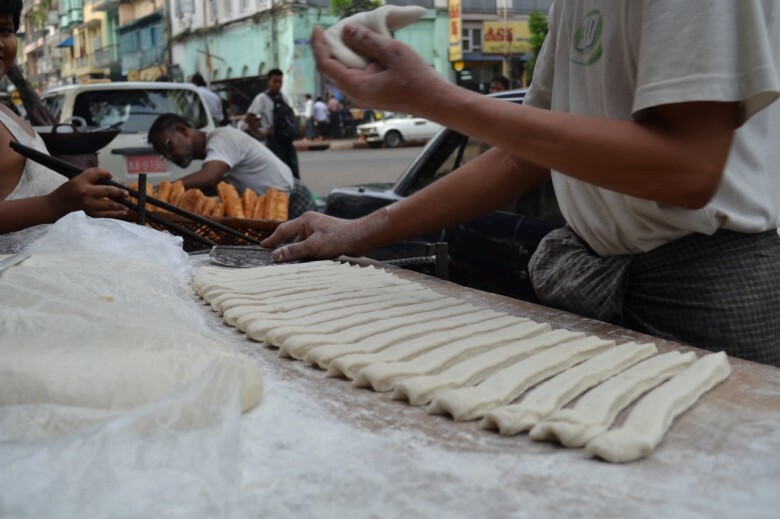 This dough can also be eaten with savoury steamed yellow beans cooked with oil and salt. You can also get e kya kway stuffed with meat and deep fried again. It is called e kya kway asar thoot – stuffed e kya kway. Best reached by bus either from Mandalay or Yangon, people come to Inle lake to disappear from the outside world. Daily life around the large freshwater lake in the Shan state is an intricate dance for the Intha people. Fishermen stand on the stern poised with their large cyclindrical woven baskets, rowing with one leg (see the above video). You could spend a month here hiking, spotting the 9 species of fish found no where else in the world, paddling about the lake and relaxing. 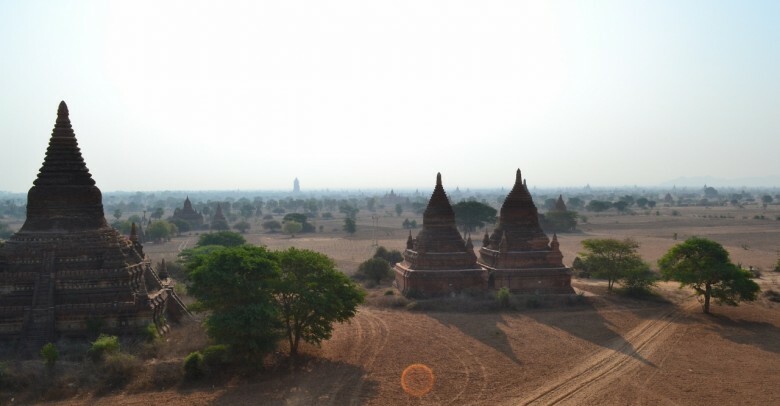 This vast plain of many astoundingly preserved temples is the image most people have in their minds when they think of Burma. I couldn’t afford the $300 dollar hot air balloon ride over the temples at dawn so I’ll be back one day. I enjoyed walking among the temples with roaming cows, though this part of Myanmar can be very touristy, over-priced and the roads around the temples are gradually being tarred. I heard from other travelers that if you want to visit a less-touristy site like Bagan was many years ago, you should visit the ruins at Mrauk-U (in West Myanmar by the Bay of Bengal). 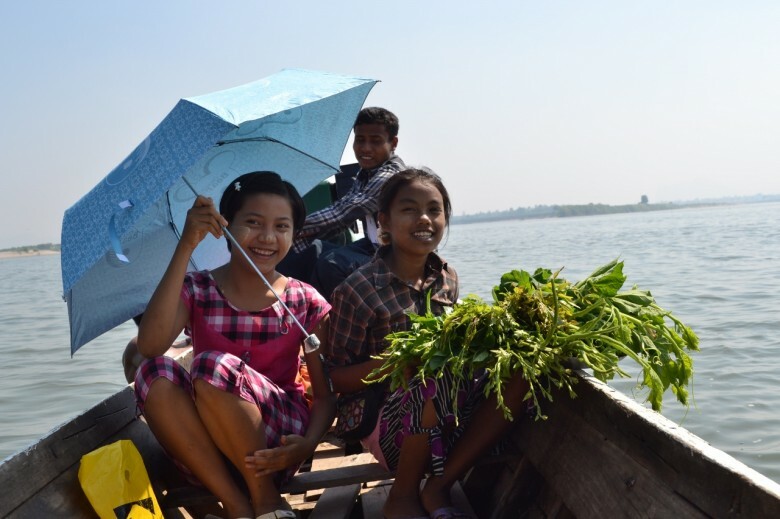 Another idea is to take a slow boat from Mandalay to Bagan (this can often take up to 13 hours). Many Buddhists make the pilgrimage to the Golden Rock to place a square of gold leaf on this rock which juts precariously over the edge of a mountain. It’s quite a long bus journey from Yangon and you might not have much time at the rock when you arrive unless you decide to stay the night sleeping on the mountain and catch a return bus the following morning. 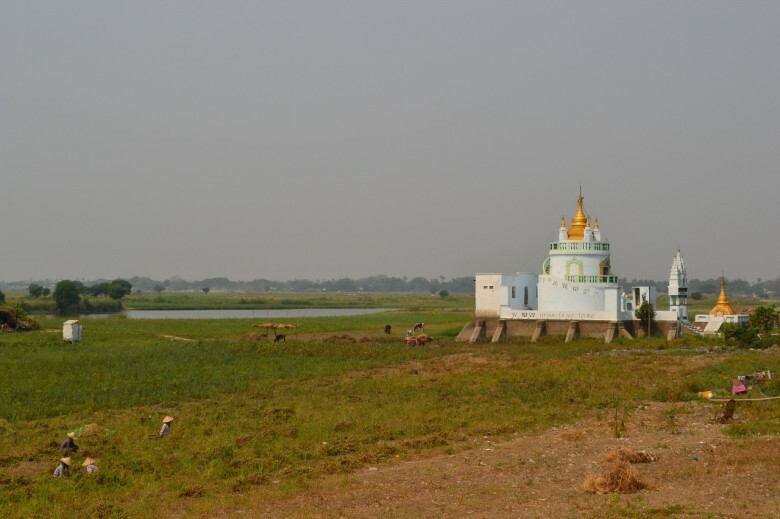 After Bagan I visited Katha, a village quite North and the setting of Orwell’s famous novel Burmese Days which exposed the hypocrisy of the British Raj. I took a 12 hour train from Mandalay to a station near Katha with plans to spend a day there before going further up the river to Bhamo by the Chinese border. 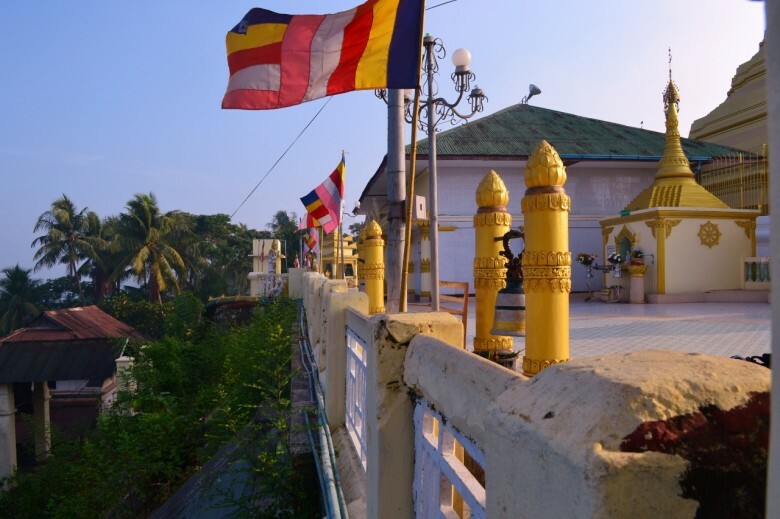 My plans were thwarted by government ferry restrictions to Bhamo so I passed a pleasant two days exploring the small Ayeyarwady River town, visiting the old British club and the pagodas. I then decided to take a bus back to Mandalay as I was running out of time. This bus journey started with a precarious ferry ride and ended up lasting 22 hours owing to a puncture. There are not many tarred roads so a lot of people suffered from motion sickness. Take your sense of humour and a strong-stomach along, sick bags and dusk masks are provided. I took a train from Mandalay to Maymo Hill Station now known as Pyin Oo Lwin- this is where the British escaped to the hills during the blistering April heat- it feels almost alpine and there are British-style country buildings and roses. Continue on the train past buffaloes working in the fields to the the town of Hpisaw. Along the way you will cross over the Gohtiek Viaduct which was once the highest railway trestle in the world, completed in 1900 and used by the British to gain control of the Shan states. Stick your head out the window as you go over the gorge and feel your stomach drop through your knees when you see the 250 metre drop to the river below. The train from Mandalay to Hsipaw takes 11 hours and costs 4$ or 7$ First Class (but it depends on how the officials are feeling that day). The train should leave around 4am. 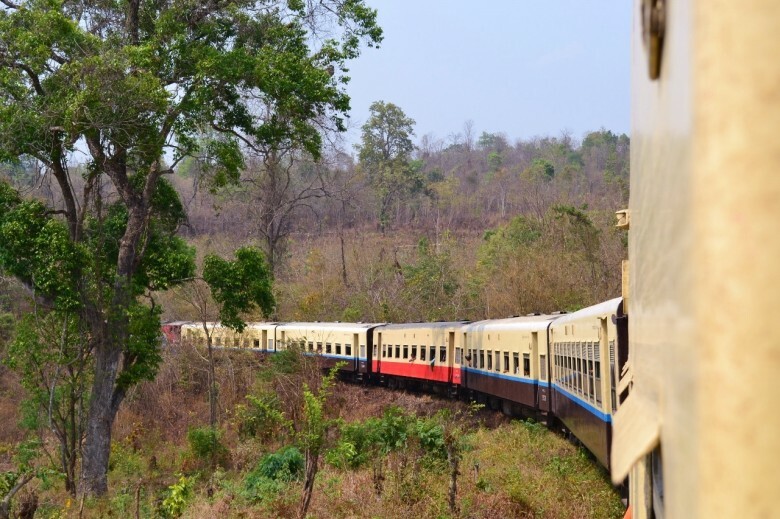 If you get off the train at Pyin Oo Lwin then you can take a 7-hour train to Hsipaw. 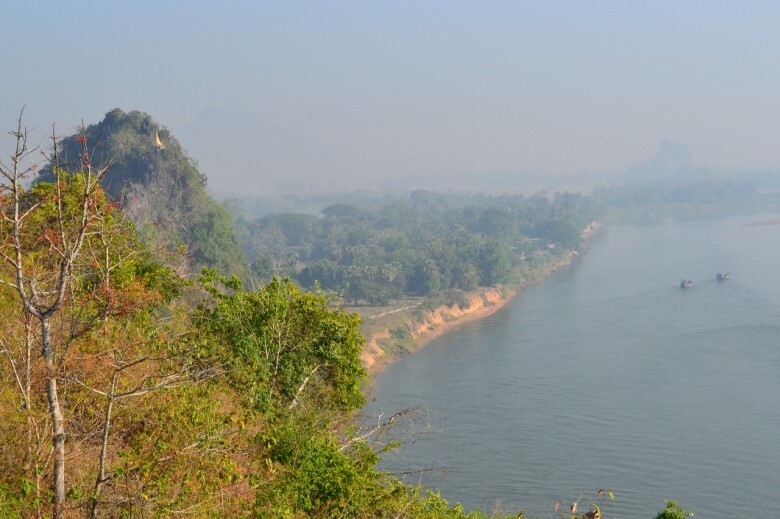 At Hsipaw you can go on a one day or many day trek into the hills, with or without a guide. You could also sit by the Dokhtawady River and drink a beer while watching the fishermen navigate the river on long, thin wooden boats or the monks passing by at dawn in their pomegranate robes, preceded by a clanging bell. The friendly people, the sunsets, the isolated stupas on mountain eyries, the hot sweet tea in wooden tea houses will stay with you. 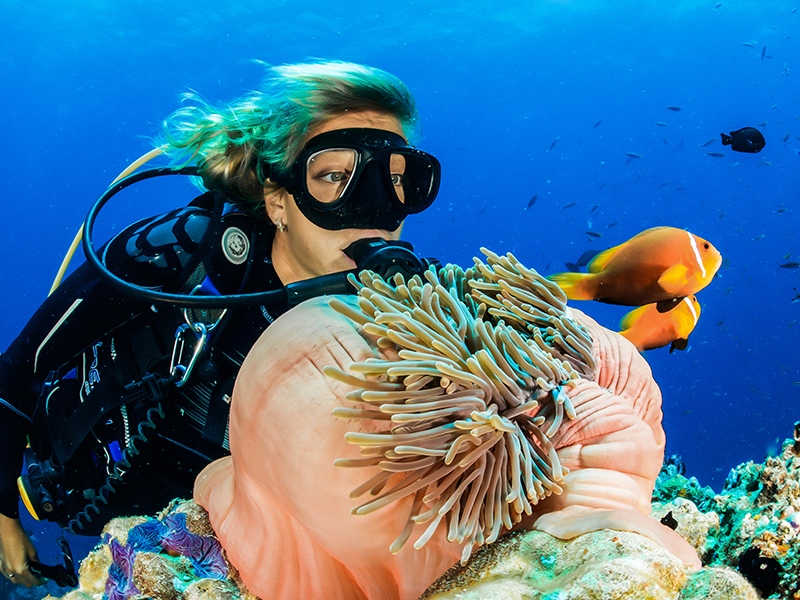 And there’ll be more waiting for you when you go back – little-visited beaches, isolated pagodas, and diving spots known only by local people just waiting to be explored. For me it’s definitely a when and not an if. Thinking of going? 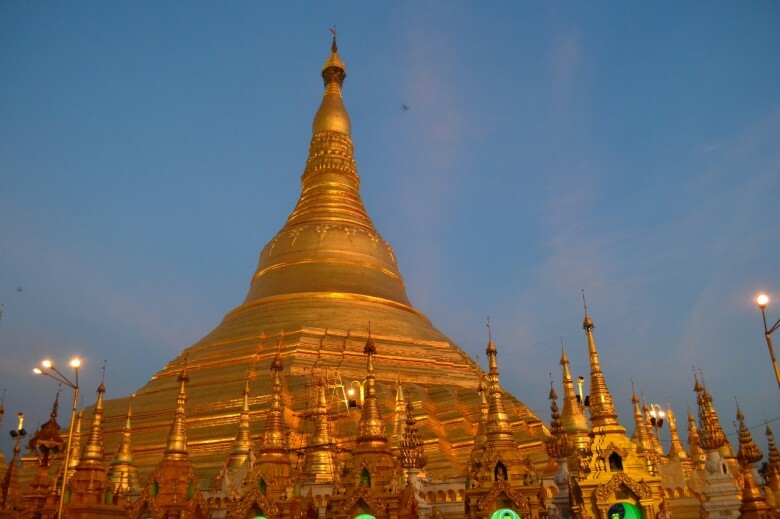 Click through to view accommodation options in Yangon, Mandalay and Bagan. Have you been to Myanmar? Which was your favourite experience? Let us know in the comments below. So amazing. Thank you for sharing the article. Hope to hear more from you. Thanks for the positive feedback Henry, much appreciated! Hello! The place is so amazing and more because of the way you have described everything in such a nice way! 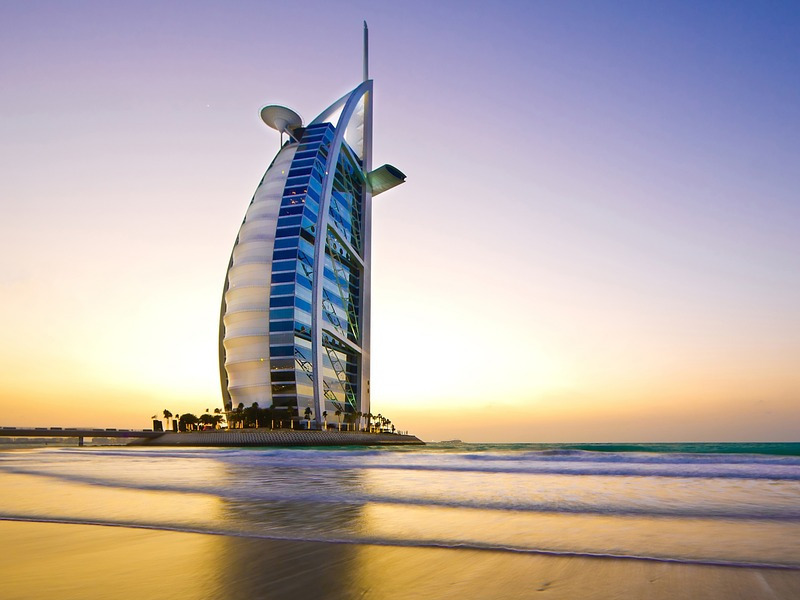 All the details regarding the e-visa and travelling related things are quite helpful. I have been planning to visit Myanmar from some time and your post has surely helped me a lot! Thanks a ton!